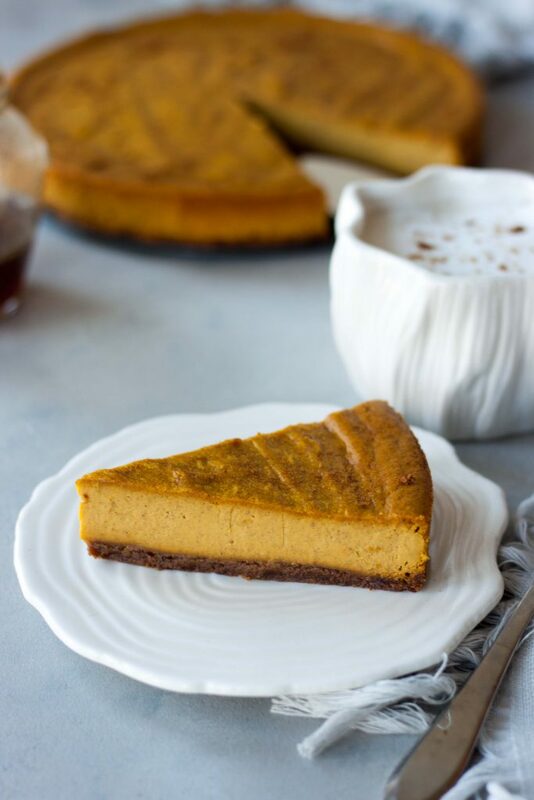 The house smells so good and I wish I could share a slice of this delicious baked Vegan Baked Pumpkin Chai Cheesecake with you! 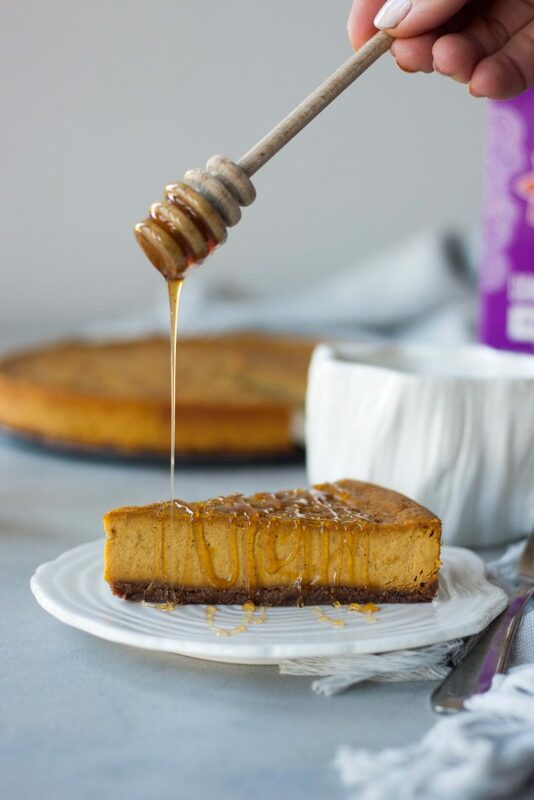 Yes baked vegan and gluten free cheesecake (except when drizzled with honey but you can sub bee free honey) that is a little more comforting then a raw no bake cheesecake and oh so cozy. Still chilled like traditional cheesecake but this has a slightly more creamy feel. This simply delicious and versatile cheesecake is so magical. Raw vegan cheesecakes are loved by all friends and family yet I really wanted to make a baked one closer to the original and no surprise they still love it and I think even more then the raw versions, except maybe the Raw Chocolate Mocha Cake that one tastes like pure fudge and is a favorite. I have many non vegan friends that have made it for their families and it’s always a hit. Even no longer being vegan this is a go to dessert with lactose and dairy issues in our family and all the dietary restrictions (also gluten free) with our friends and family. The secret ingredient to this baked cheesecake… ground chia seeds! It gives it fullness and bakes up perfectly creamy you can’t even tell they’re in there! You won’t even know it with the pumpkin and warming flavors of the chai, they pair so perfectly together. The crust is a snickerdoodle cookie crust, one of my favorite fall cookies and it pairs so perfectly with the chai spices and pumpkin. Desserts are meant to be enjoyed and while I don’t want to go ruin the love for this recipe by saying it’s a healthier version of the classic cheesecake I will just put it out there in case you need a little justification, not that anyone ever should, to have dessert. I’ll break it down just a little. Chia seeds are packed with omega-3 fatty acids, protein, fiber, antioxidants, and calcium. Pumpkin is a great source of beta-carotene, a powerful antioxidant, and fiber. Cashews have vitamins, minerals and antioxidants. Of course there are healthy benefits to all three of these foods in addition to just the nutritional breakdown. There is still sugar, I like to stick to coconut palm sugar and pure maple syrup or honey but also stick to unsweetened chai concentrate and dairy free milk. Again it’s a dessert and is meant to be enjoyed as a treat. 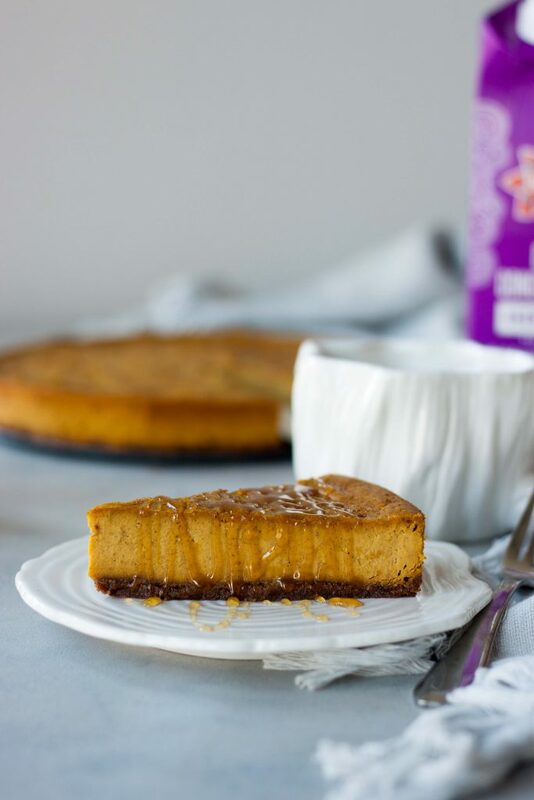 While I like mine topped with spiced honey, which is not vegan it is an option and does not take away from this pumpkin chai cheesecake being vegan. You can use pure maple syrup, bee free honey, (we tested it with local Bee Free Honee) or a local honey like the one we love to use Bare Honey Spiced Honey. You can even go with a caramel sauce but I didn’t want to overpower and lose the subtle and simpleness of this cheesecake with a heavy topping. Therefore I kept it in the name since saying dairy free people may think there are eggs and I didn’t want to keep it just Baked Pumpkin Chai Cheesecake as it wouldn’t stand out to those looking for a dairy free or egg free cheesecake. Plant-based cheesecake also didn’t sound right to me. If you are more of chai fan you can add a little chai seasoning if your chai concentrate it’s strong enough or omit milk and use all chai concentrate. To get more of a pumpkin pie taste and still keep the warming spices of the chai add a teaspoon of pumpkin pie spice. I love the subtleness and warm spices of this cheesecake and debated making it stronger or maybe going more pumpkin since everyone is crazy about pumpkin this time of year but after testing and tasting everyone agreed to keep this subtle balance. This would make a great Thanksgiving dessert. I still can’t decide if I should bring this or Vegan Marshmallow Meringue Pumpkin Pie. I still have 2 weeks to decide. Either way, and even though I’m not a pie person this photo basically sums it up, “I’m just here for dessert” well and the cranberries just give me a plate of those and I would be one happy girl. If there were some plain sweet potatoes that aren’t swimming in sugar pile those on too! 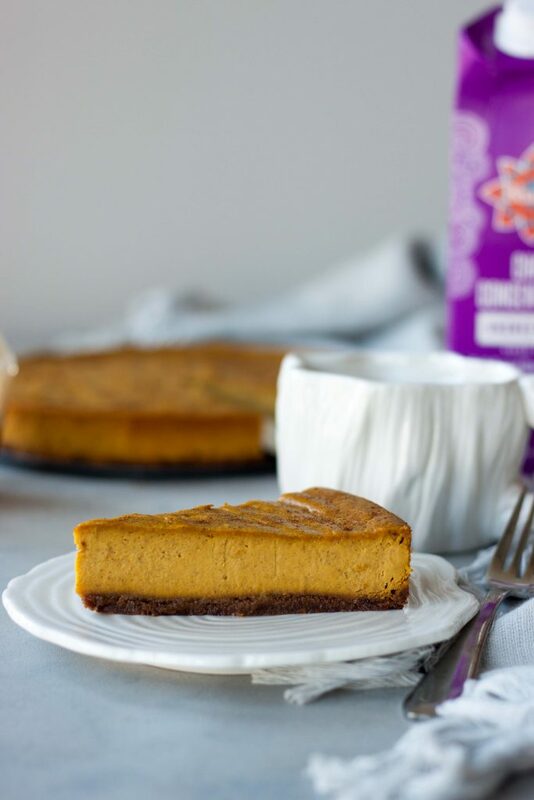 Delicious creamy Vegan Baked Pumpkin Chai Cheesecake (also gluten free) is simple and the perfect end to your next dinner or get together that everyone will enjoy. * Or you can use 6oz ready to drink chai beverage. ** You can grind chia seeds into powder, just make sure they are fine ground. Like it, pin it for later (2 options)! YES! It’s so perfect in this cheesecake! The texture looks ahhhmaazing. I love chai in everything, so I can’t wait to try this. I’m still going strong with pumpkin everything, so adding this to the list! Hope you love every bite as much as I do! This looks so amazing for Thanksgiving,…or today! 😉 I can’t wait to try it – it looks so creamy! I love the addition of chai! 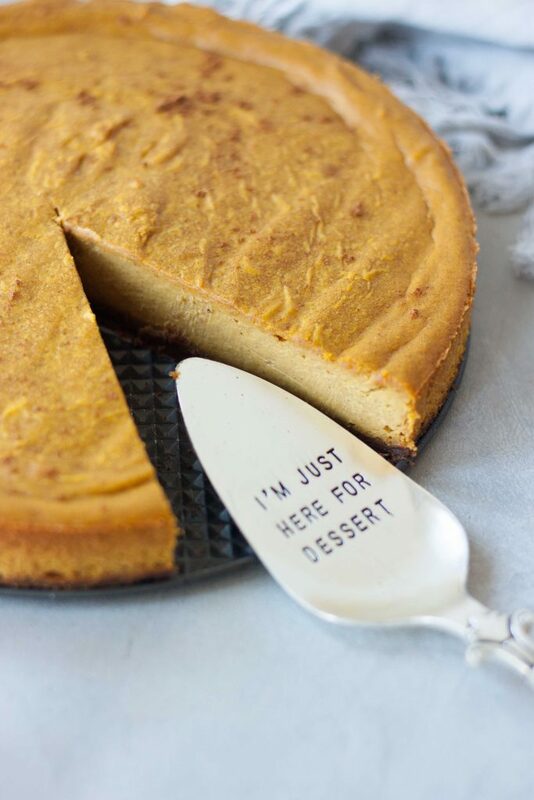 I am definitely going to do that with our pumpkin cheesecake next time… and the snickerdoodle crust?!! yes, please! It’s perfect with the warming spices and the snickerdoodle crust I can’t even think about another crust with this it’s so good! I love that you baked this! I usually do raw cashew cheesecake, but honestly never thought to try baking. With the added moisture from the pumpkin, I could definitely see the need though. It’s the magical chia seeds and extra liquid too, I can’t even explain it but the texture is amazing and so much more comforting baked. I love chai and I bet this cheesecake is amazing with that flavor infused! It’s so warming and comforting! This cheesecake looks so good! I want a big slice of it right now! Wish I could share a slice with you!! Love all the different flavors in here. Chai always makes me happy! Chai is so cozy and the spices so comforting! This sounds SO amazing! Love that it’s vegan, too. Definitely going to have to make this for Thanksgiving! Oh yum! This looks beautiful! Love the drizzle of honey on top! Thanks for sharing! It tastes as good as it looks, wish I could share a slice too! Yum! The recipe sounds delicious and a snickerdoodle crust? Yes please! It’s so good and the chewy snickerdoodle crust is a must! I love cheesecake but haven’t ever tried making it because it seems so rich. I think your vegan recipe might be healther. Thanks! This is a little rich but nothing like traditional cheesecakes. 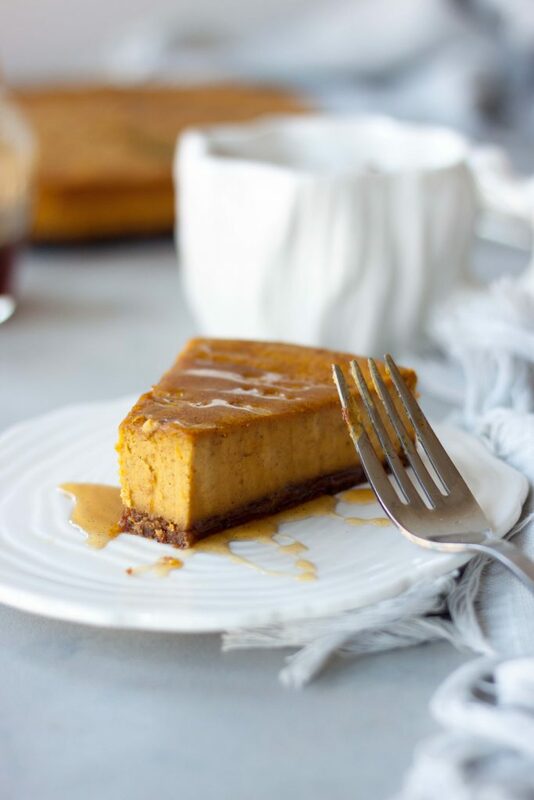 I love pumpkin cheesecake, so I can’t wait to try this yummy vegan version! I love how clean the ingredients are!! I think this deserves a test run. I don’t want to wait for Thanksgiving. It looks amazing!